SANTA ANA, CA--(Marketwired - Sep 16, 2013) - As a major licensing win for home entertainment system products, DarbeeVision, Inc., a pioneer in the field of digital image enhancement, has licensed its Visual Presence™ technology to Mountain View-based OPPO Digital for their Model 103D Blu-ray player. The 103D will provide Visual Presence image enhancement processing in real time, adding Darbee Visual Presence depth, clarity and realism to any video content -- resulting in an unparalleled viewing experience for HD and upscaled HD to 4K video. The first public demonstration of the 103D will be at DarbeeVision's booth #2366, at the CEDIA Expo in Denver, Colorado, Sept. 25-28, 2013. This exciting showcase of the new Blu-ray player will run the duration of the show, and will feature HD and upscaled 4K displayed video content. OPPO's products are recognized for their high quality workmanship and performance. Their design approach focuses on the creation of a superior Blu-ray player viewing experience that delivers high value, cutting edge technologies and innovative features -- making them a natural fit to partner with DarbeeVision. "Being selected by OPPO as their new feature is a wonderful confirmation that we provide a high value video enhancement technology. 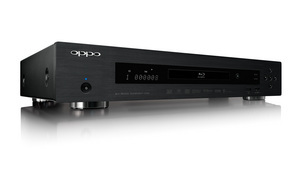 We know that the OPPO platform provides unparalleled image fidelity for a Blu-ray player. Being associated with their 103 Model Blu-ray player system, at the pinnacle of home theater fidelity, guarantees that our processing is being seen at its best," says DarbeeVision, president and COO, Larry Pace. "We are certain that the 103D will produce an un-paralleled viewing experience." The BDP-103 Darbee Edition (BDP-103D) is the latest addition to OPPO's award-winning line of Blu-ray Disc™ players. Based on the successful OPPO BDP-103 player and aided by Darbee Visual Presence (DVP) technology, the BDP-103D takes home theater beyond accuracy and brings exceptional depth and realism to the visual experience. Just like the BDP-103, the BDP-103D reproduces video from DVD, Blu-ray, media files, and streaming services with accuracy and fidelity. Beyond that, thanks to the patented DVP technology, the BDP-103D can embed stereoscopic depth cues into the video and deliver an enhanced image when the user turns on one of the three Darbee enhancement modes. The changes made to the video are adjustable so that the result can range from being very subtle to very noticeable, and the DVP technology analyzes the video in real time and enhances visual depth and detail in such a way that it does not alter the calibration of the home theater system. The BDP-103D unifies the often conflicting goals of an ideal home theater: reference quality accuracy to express the filmmaker's original intent, and tweaks to suit the viewer's personal tastes. DarbeeVision is offering its Darbee Visual Presence technology for consumer electronics product integrations. Please visit www.darbeevision.com or call 657-600-8241 for more information. To learn more, please visit DarbeeVision.com, and DarbeeVision's Facebook. DarbeeVision Inc. was founded by Paul Darbee and Larry Pace to commercialize system products, discrete hardware and embedded solutions based on Darbee Visual Presence Technology. DarbeeVision is offering its Darbee Visual Presence technology for consumer electronics product integrations. The privately held company is headquartered in Santa Ana, California, USA. For information call 657-600-8241, email info@darbeevision.com, or visit www.DarbeeVision.com. All DarbeeVision™, Darbee™ patents, trademarks, copyrights and licensing are a product of DarbeeVision Inc.
Pictured above, is the OPPO Digital 103D Blu-ray player, the world's first Darbee Visual Presence enabled Blu-ray player. The 103D provides Visual Presence image enhancement processing in real time, adding Darbee Visual Presence depth, clarity and realism to any video content -- resulting in an unparalleled viewing experience for HD and upscaled HD to 4K video.